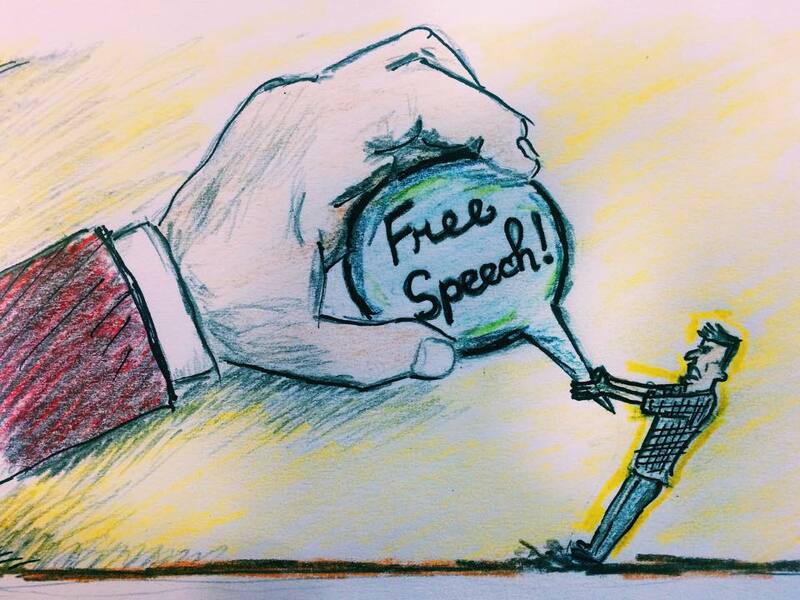 We can all agree that freedom of expression is a necessary pillar of democracy. This right is enshrined in Article 10 of the European Convention on Human Rights, to which Ireland is a party. But the conference raised some very valid issues related to the exercise of this right. Dr. Zuhtu Arslan, President of the Constitutional Court of Turkey, noted in his opening speech that free expression not only maintains diversity and pluralism in a society, but is also an end in itself. The saying “I think, therefore I am” implies that we, as moral individuals, need to express ourselves. Expression, the sole instrument with which to communicate our thoughts and fulfil ourselves, warrants a high degree of protection at international level. The challenge of striking an adequate balance between protecting and limiting free speech is of utmost relevance in Europe at the moment. On one hand, we have an abuse of the right in the form of hate speech such as homophobia or incitement of hatred and violence against religions, ethnic minorities, and racial groups. On the other hand, we have breeches of free speech seen in the perils faced by journalists in countries where extremist and terrorist groups reside. In this article, I will focus on the issue of hate speech as an attack on the freedom of expression, and contrast it with the right to offend, insult or shock (protected under Article 10). I will also look briefly at terrorism as a form of inhibition on free speech. In a pluralistic society, we must prudently assure that the line is accurately and fairly drawn between offence and hate speech. It would be oppressive to exercise censorship over all minority or outrageous views, but it would also be an injustice to fail to put in place any mechanisms to censor speech that goes beyond mere insult, shock or offence, because with rights come responsibilities. The question of defining the difference between offence and hate speech is particularly relevant in the wake of the Charlie Hebdo killings. Not only does the act of murder breach the right to life, but in this context the massacre amounts to a breach of the freedom of expression. The people who were killed because they exercised that right; they are no longer able to exercise it. The cartoons were offensive – but that is their purpose. They are not published for the sake of looking pretty; they are published to provoke debate. Although the general reaction of the public was outrage at these killings, coupled with the view that they do not amount to hate speech, the line is extremely thin in terms of what counts as incitement. The result is a variety of different opinions about Charlie Hebdo, including some who think such extreme satire should be censored as it does amount to incitement. While hate speech is expression used to incite hatred and violence, usually characterised by an intolerance towards the people to whom the hate is directed at, an insult is the act of speaking rudely or with offence. Hate speech is commonly seen in the form of racism, Islamophobia and homophobia, to name but a few. The key difference, and the reason why one is protected and the other is not, is that hate speech aims to provoke violence, while an insult aims to provoke argument. Argument is a crucial element of any democracy. It allows us to question and criticise current affairs, to demand higher standards. Hate speech, on the other hand is the first step on the path to criminal activity. It encourages violence and intolerance of views that are not our own. Article 10 includes in its scope of protection the right to offend, shock, or insult, including provocation. This means that, as unpleasant as it can be to experience online trolling, it is and should be protected – so long as you remain within the boundaries of insult, offence and shock. To cause offence is to cause displeasure. However, offence can often be an expression of the truth, despite a resistance to accept it. For example, if somebody tells you that they don’t like the way you compose yourself in certain situations, your immediate reaction is to take offence because they have insulted your personality and characteristics. You are displeased by the statement. But, the statement may be founded upon a truth, and perhaps you do need to assess the issue that has been raised. If we reflect upon the initial offence, we can learn ways to better ourselves. This scenario can be applied on a broader level by listening to the criticisms and offences directed mainly towards governments, most often by journalists. These watchdogs criticise every move made by our governments and spark public debate about the state of current affairs. The things they say may be offensive to the people they are directed at, but they essentially call out these representatives on their shortcomings, holding them to account where governments fail to do so themselves. These benefits of offence highlight the need to accept it. Learning tolerance will better us as a whole, and will contribute to the creation of a more equal society where we can learn to see past our differences. It is an awful experience to have something you wrote, something that you firmly believe in and justify respectfully, torn apart and insulted by online readers. Their anger at your opinion screams at you from the screen as you read their comments. But in the same way the commentator insults the writer, the writer has probably insulted the commentator. This type of dialogue, although on the nasty end of debate, must be and is protected by our right to free expression. It is better to have the discussion, however unpleasant it may be, than to not have it. Fair and assertive debate is definitely preferable to no debate. To live in a true democracy, we must be able to freely criticise things we disagree with. Fair debate is achieved by the exercise of free speech, so by inhibiting the right to free speech we are denying a platform for fair debate. This is, unfortunately, the reality of the situation in many countries. The population is silenced by the fear of offending those in power, which would lead to persecution. This is the very reason that we must continue to shock, insult and offend. It opens up the debating field; it forces us to question everything. This is why the right to freedom of expression is so important. In war-torn countries and places ruled by oppressive dictators, free speech is neither respected nor valued by those in power. It is through this disrespect that they have come to power. Free speech is one way we begin to combat these rulers, and the measure of respect for free speech can be used to gauge how close a country is to democracy and stability. An insult by one person to an oppressive leader, if voiced clearly, can lead to public dissatisfaction, which can result in the unification of the people against their oppressor to establish a democratic society. Obviously, the situation is more complex than that, and it will not be as easily resolved as I have suggested. But that is the basic idea. We must accept offence and engage with it. Offence is an opportunity to inspire dialogue between different opinions. Rather than responding to offence with hate speech, respond with a reasoned argument as to why you think the offender is wrong. Use your freedom of expression to deal with a conflict of opinions. Hopefully we will be better for it. Committing murder because you disagree with an offence is not an acceptable or progressive means by which to deal with conflict. Passion and conviction cannot turn into violence. Finally, with rights come responsibilities. We have the duty to use our rights wisely for the benefit of the public, to encourage proper debate in the interest of improving our society, and to show due respect for the differing views of others by not engaging in hate speech. The invitation of Maryam Namazie to speak by the Warwick Atheist, Secularist, and Humanist Society was opposed by the Warwick Students’ Union because of her offensive views, not because she had racist and extremist views. She was initially banned because the Union feared she would incite hatred against Muslim students. As pointed out by a fellow writer for this paper, based on her track record, this was not likely to happen. It must be noted that not everybody will agree that the Charlie Hebdo cartoons and the views of Namazie do not amount to incitement, particularly as they relate to religion. Much debate has been given to disagreements about whether particular expressions are or are not hate speech, a debate which is very much alive. This draws attention to the nuance that it is sometimes difficult to differentiate between offence and incitement, highlighting the tenderness of this issue. The general atmosphere at the conference was that free speech is one of the most important aspects of modern society. The discussions were held to examine the issues faced in protecting the right. An entire delegation of European representatives debated for two days about this right; their primary aim was to ensure its security, to ensure that we can all freely exercise it without fear of persecution, while not abusing it. So use it. Encourage speech, start debating. We should be inviting controversial speakers to College events. But objections to speakers who are outright racist are valid, because there lies a real potential for hate speech and incitement to hatred and violence. Where the speaker poses a real threat to the safety of the people, and has been known to invoke hatred on previous occasions, it is legitimate to refuse to allow them to attend. This would be a fair restriction on the right to free expression as outlined in paragraph 2 of Article 10. The purpose of insult and controversy is to spark debate and protect free speech, the core elements of democracy. Bláithín Sheil is a final year Law and French student. After a year abroad in Strasbourg, she feels more French than Irish. Loves to run. She is the Deputy Comment Editor of Trinity News.